mango falooda recipe | mango faluda ice cream recipe with detailed photo and video recipe. 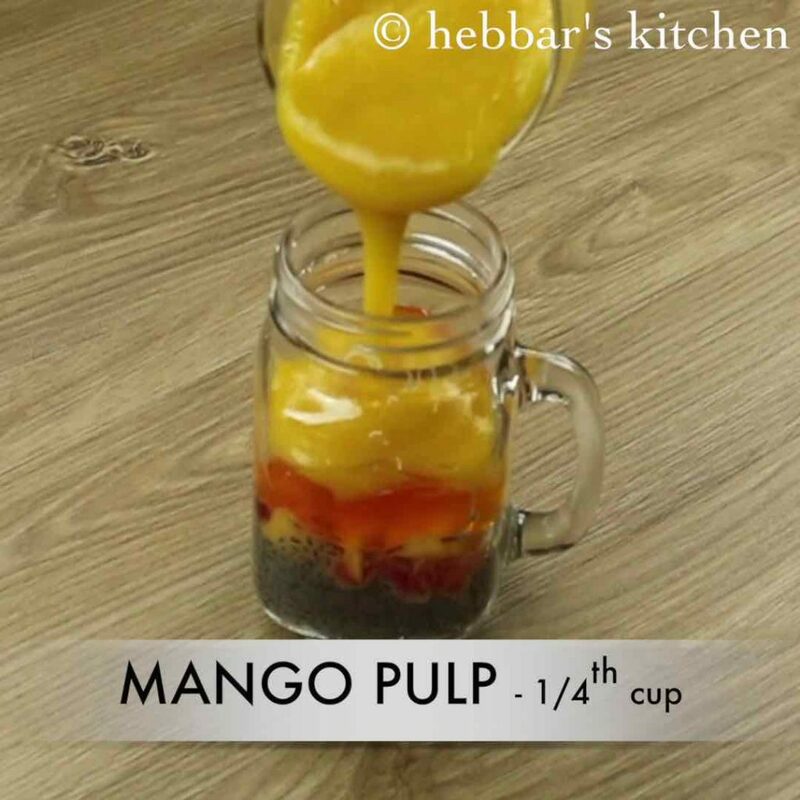 a popular summer cold dessert prepared during mango season as refreshing beverage for scorching heat. 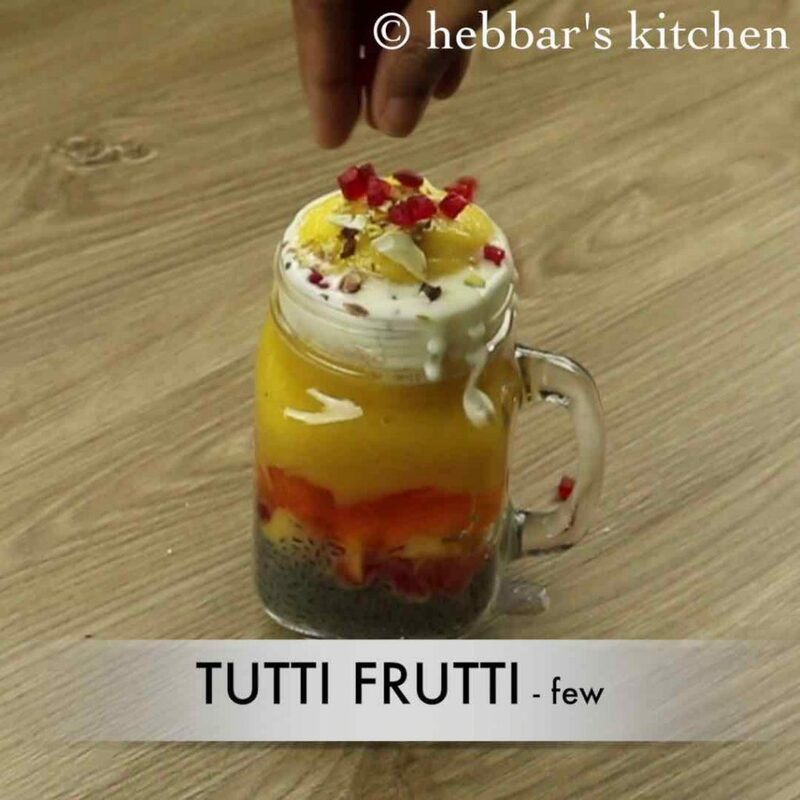 it is mainly prepared using basil seeds / sabja seeds or popularly known was falooda seeds mixed with falooda sev and mango pulp. 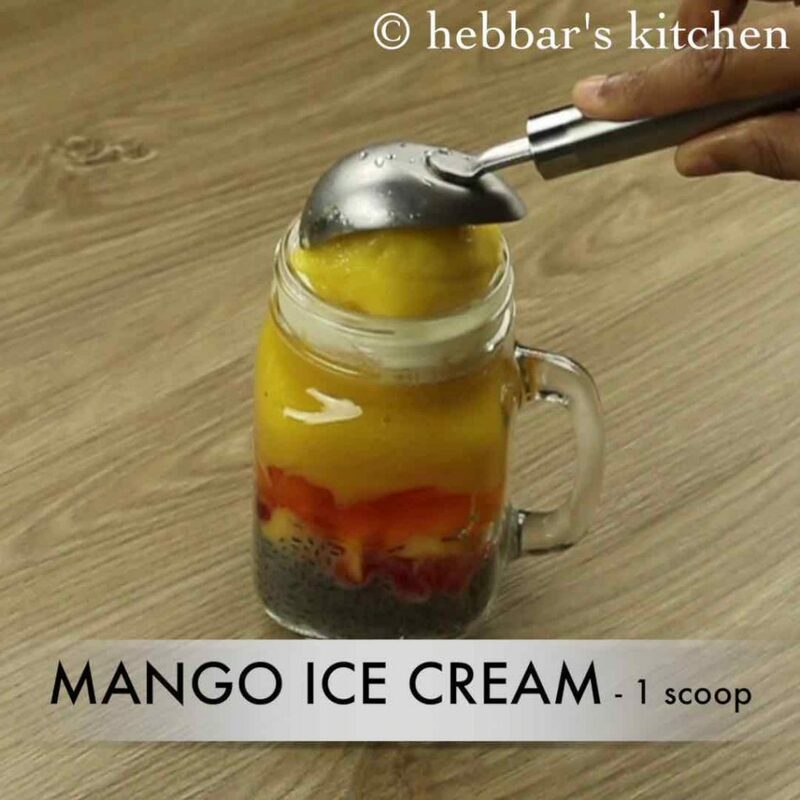 mango falooda recipe | mango faluda ice cream recipe with step by step photo and video recipe. basically this is adapted version of traditional original royal falooda drink flavoured with mango pulp flavour. 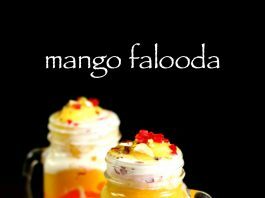 while the popularity of mango faluda surges during summer season, but can be easily prepared with store bought mango pulp too. i have already shared the traditional royal falooda recipe which is mainly prepared from rose milk and rose syrup. where as in mango faluda ice cream recipe, thick fresh mango pulp replaces the rose milk and rest remains almost same. 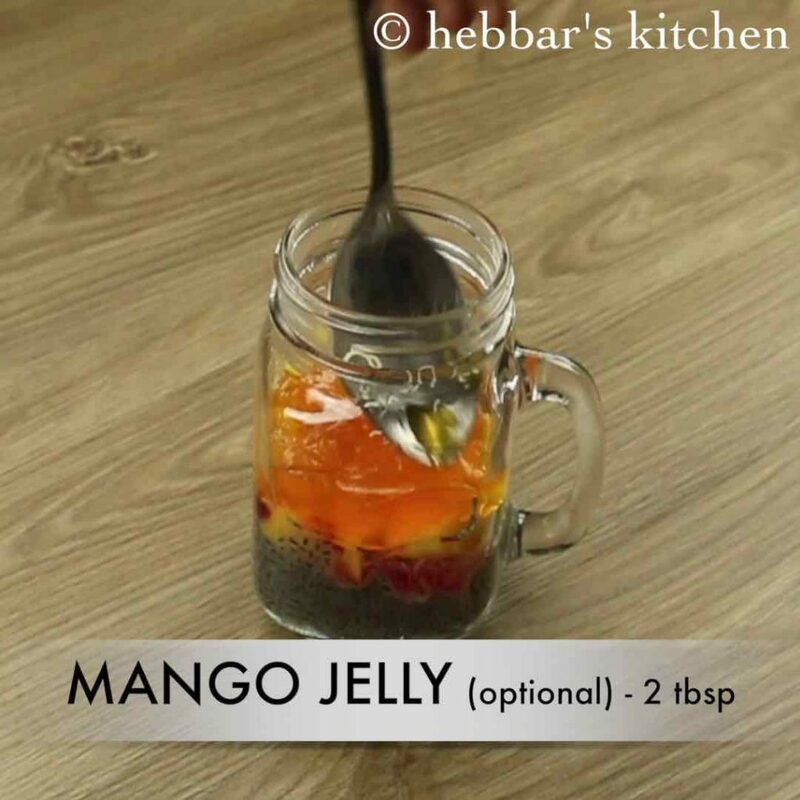 also i have added mango jelly, which is completely optional. but it adds a nice flavour to the mango falooda drink and gives a chewy twist to the recipe. 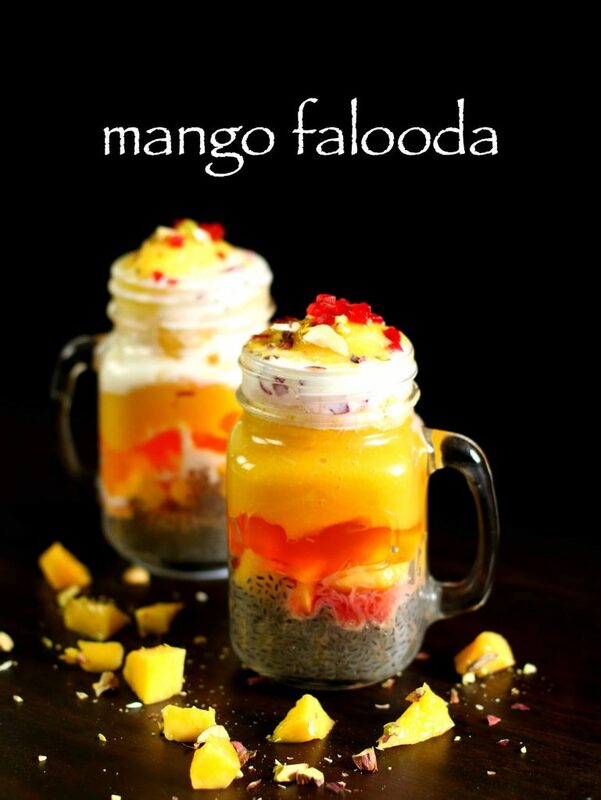 furthermore, some important variations and tips for the perfect mango falooda recipe. firstly, the amount of sugar to be used in the milk is directly proportional to the sourness of mango pulp or mango cubes. 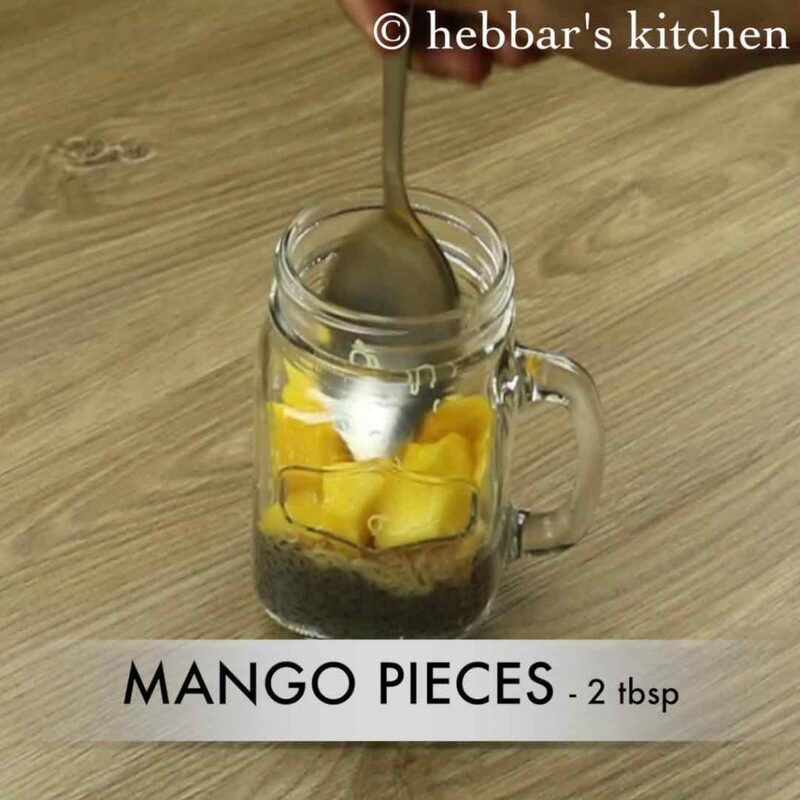 if you are using a sweet mango 1 tsp should be more than enough. secondly, i have used mango ice cream to top this beverage, alternatively vanilla ice cream scoop can also be used. lastly, the ingredients added in this recipe is according to my glass. you are more than welcome to increase or decrease according to your taste and glass. 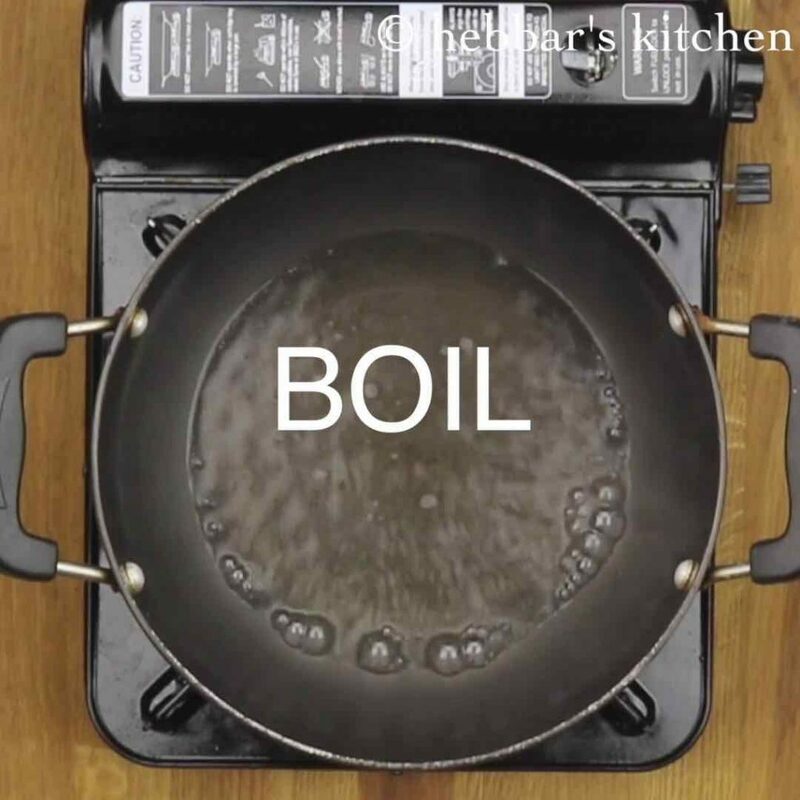 firstly, boil a cup of water. then add faluda sev and switch off the flame. 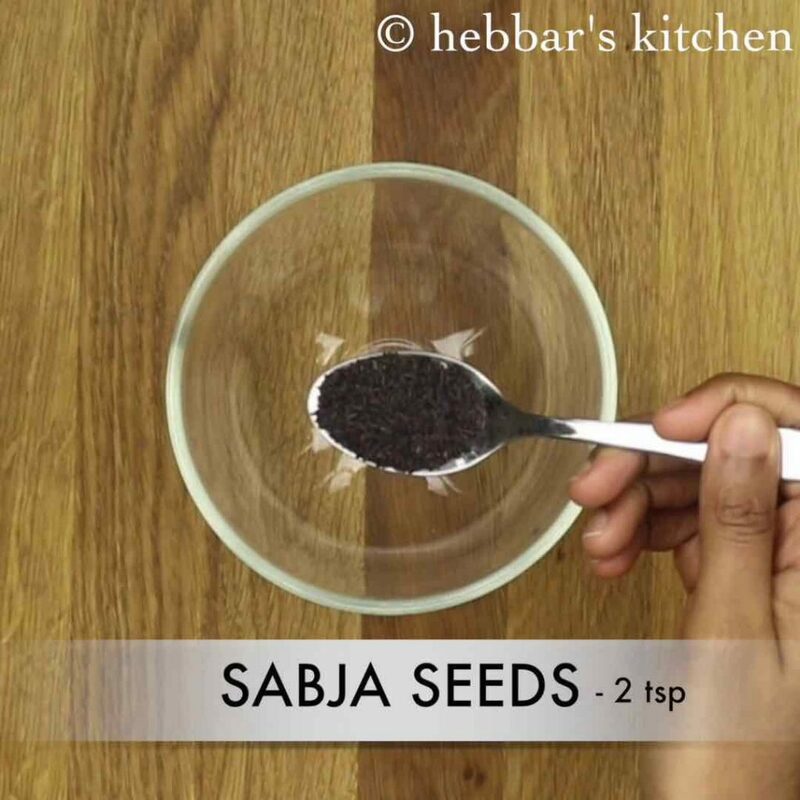 in a small cup, take 2 tsp of sabja seeds. next, add 1 cup of water and keep aside for 30 minutes. 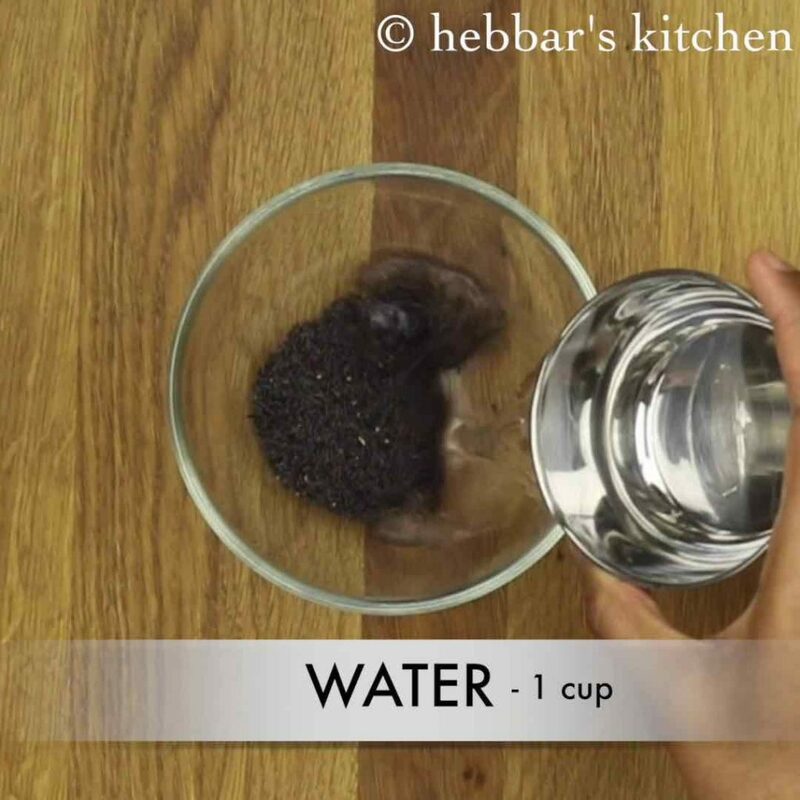 sabja seeds will swell absorbing water. 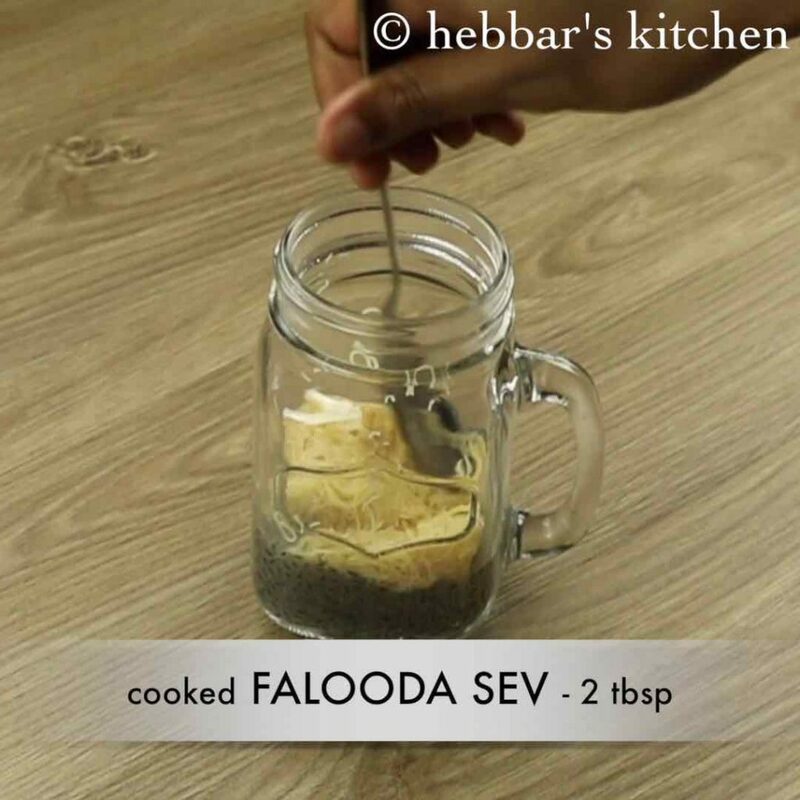 firstly, in a tall glass add 2 tbsp of soaked sabja seeds. 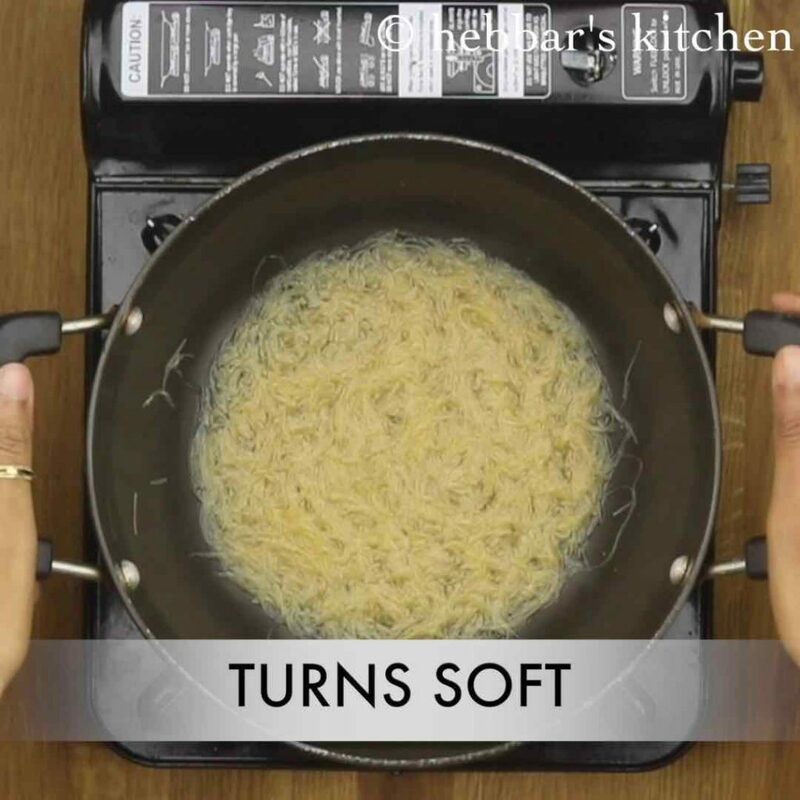 further add cooked falooda sev and set with the help of spoon. also add chopped mango pieces. add rose syrup. adding rose syrup is optional, however adds more flavour. additionally add jelly of mango flavour and level it up. also add mango pulp or mango puree. then add chilled milk. add as required. now slowly place the mango scoop ice-cream. and garnish with chopped nuts and tutti frutti. 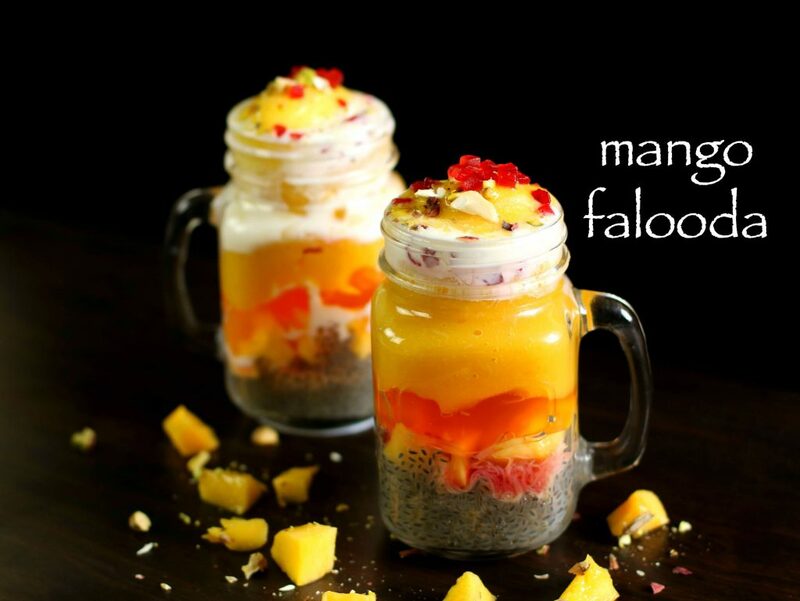 finally, serve mango falooda immediately else the ice cream will melt. 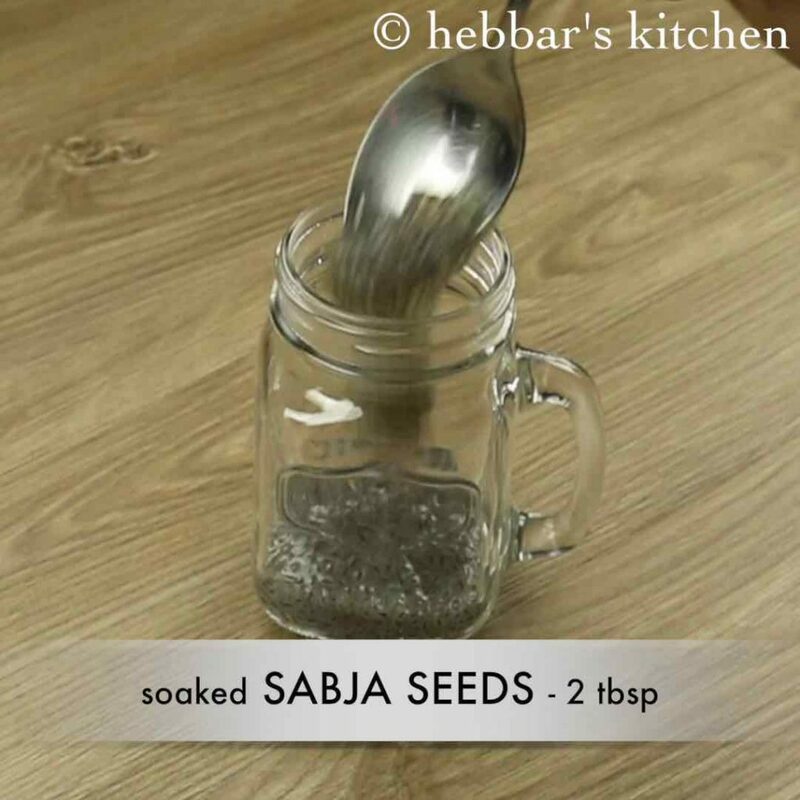 sabja seeds will swell absorbing water. the seeds will turn jelly like coating. then add faluda sev and switch off the flame. 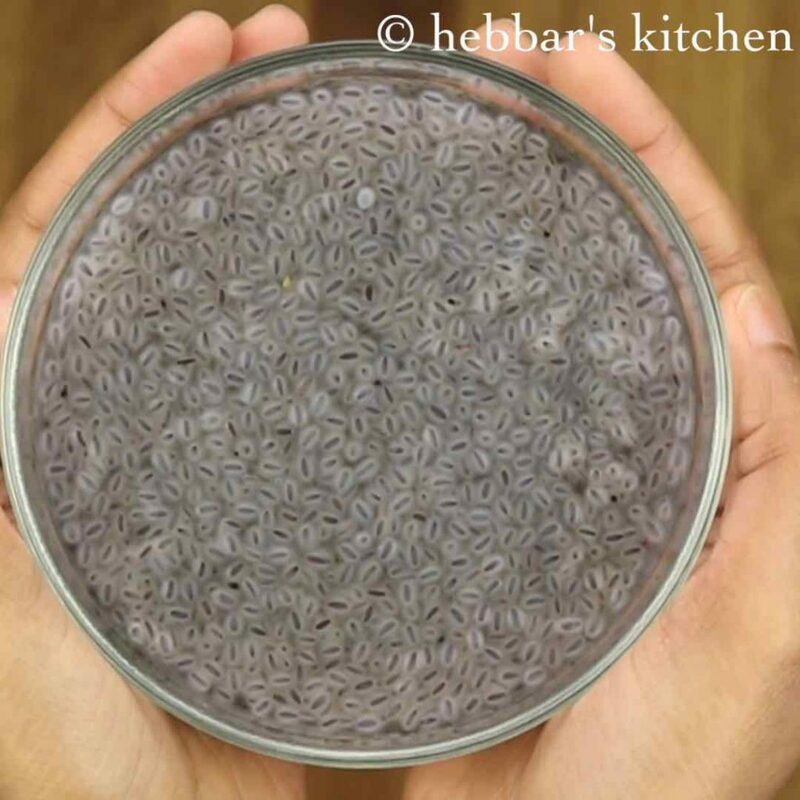 you can alternatively use vermicelli if you do find falooda sev. drain off the water once the faluda sev turns soft. keep aside. 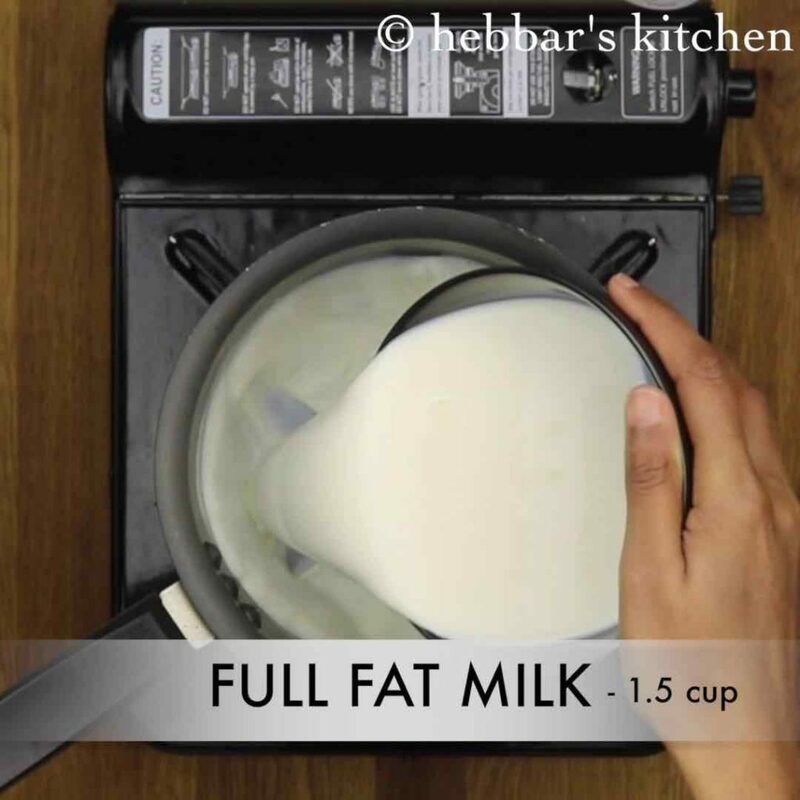 first of all, in a thick bottomed vessel boil 1½ cup of full cream milk. 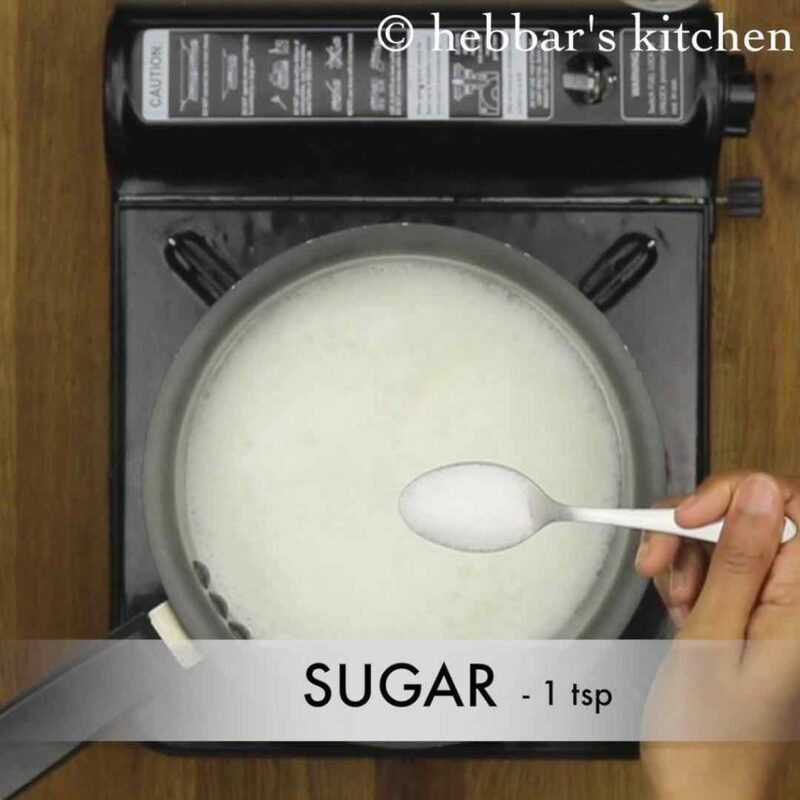 in addition, add 1 tsp of sugar and continue to boil for another minute. cool down completely and refrigerate for 1 hour. or till they turn chilled completely. 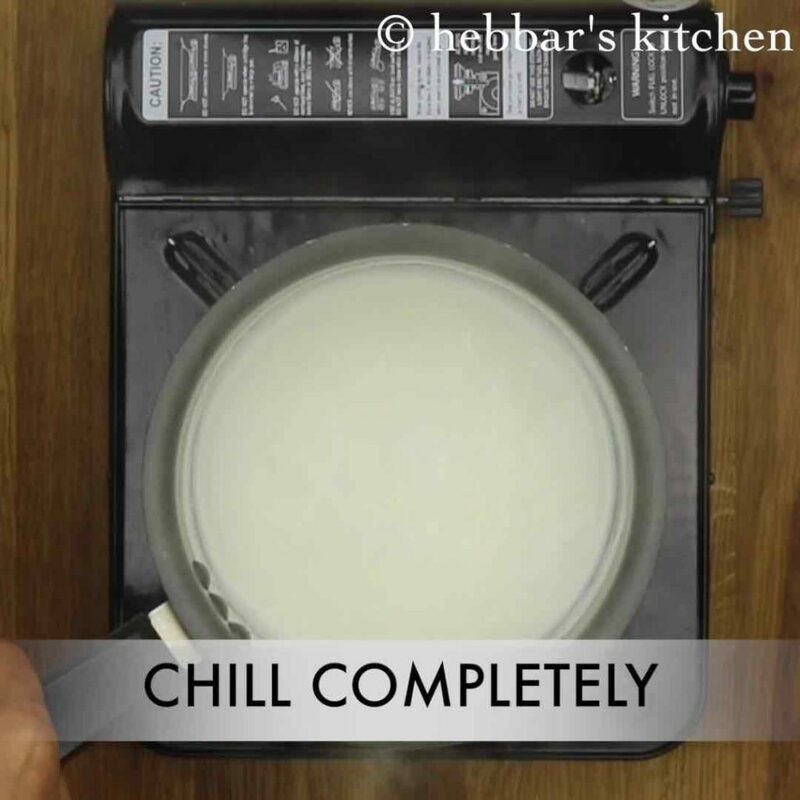 then add prepared chilled milk. add as required. 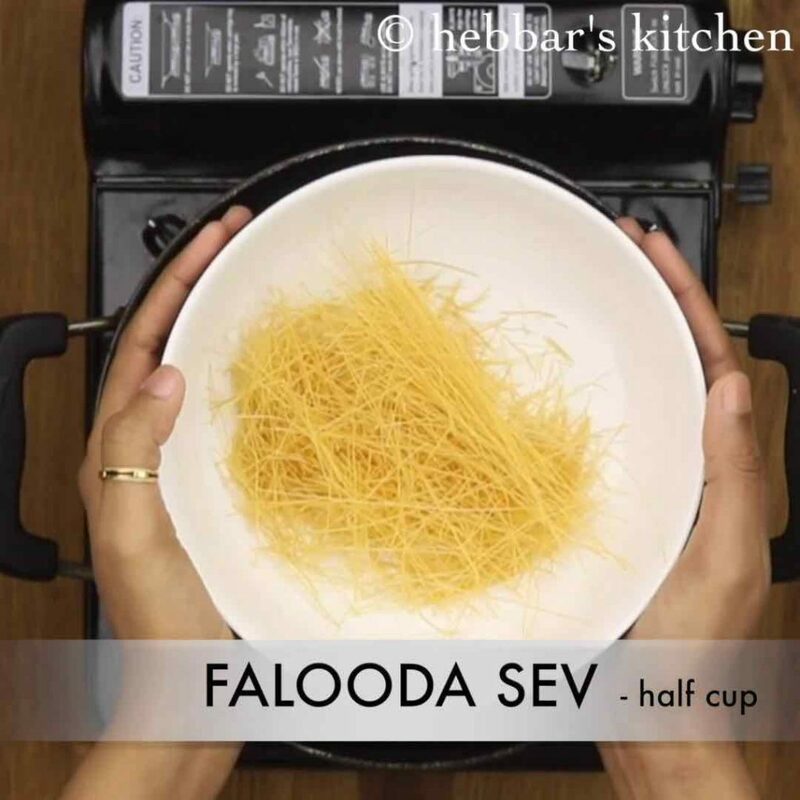 firstly, if you are not having faluda sev use normal vermicelli. 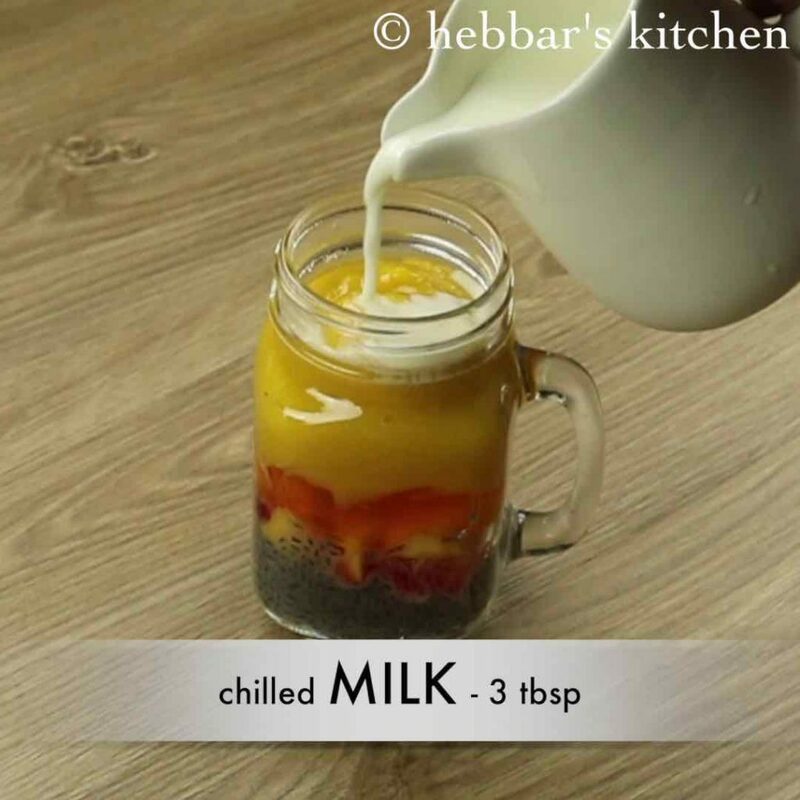 also make sure to add soaked sabja seeds and mango pulp to get the rich flavour and taste to mango falooda. furthermore, adding sugar to milk is optional. while adding sugar is not mandatory, but i would recommend it. 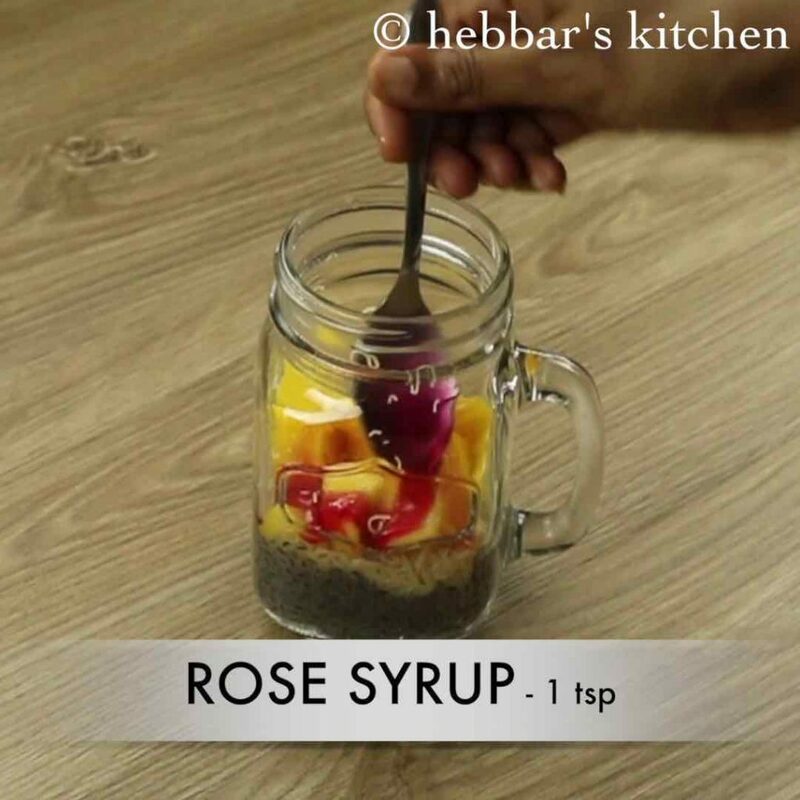 you can increase or decrease the amount of rose syrup according to your taste. moreover, if you are not able to find the rose syrup, you can also use rooh afza. in addition, always use full cream thick milk or prepare milk shake with a scoop of mango ice cream. finally, garnish with generous amount of dry fruits to make mango falooda rich and tasty. falooda is always best served instantly. perhaps you can prepare it bit earlier but i would not recommend one day earlier. i know it can be tiresome, but trust me if you serve fresh the joy in crowd will certainly kill it.